I just read this very enlightening post at one of my very favorite letter blogs, the Letter Writers Alliance. I don't know what to do about it except encourage people to keep writing letters and sending mail. I admit I'm a little worried. I DON'T want to see delivery fall to 5 days a week; I know I'm in the minority here, but I'd rather pay more for stamps. I heard about this on the news the other night and it concerned me as well. I don't have a car and the nearest post office right now is within walking distance from my place. I mail packages there and buy my stamps there. There is a mail boxes etc near by but they charge a extra fee to mail your packages for you. I know I paid a small fortune to that place just to have them go through the post office to mail a couple of packages for me. Already the cost of postage has gone up by two cents and the postman who delivers mail to the people who live in this building has had his rout doubled and has been arriving here later then usual. I hope it does not get like it was in Brazil years ago. I had a pen friend I wrote to for ten years from Brazil and some times I would not hear from her for four months because they were having one postal strike after another there. I guess all anyone can do is hope for the best. I agree, paying more for stamps would not be the end of the world. I don't like the idea of the post office dieing out at all. i would gladly pay more for stamps as well . I keep hoping that the current economic situation will send more people to the mailbox. (I just read an article about young people taking up sewing again, so I've been hoping they'll take up letter writing, too.) But, that said, I don't mind paying a little more to mail a letter, if need be. As it was pointed out in the LWA post, there are not many other things in this life that are such a deal. For 44 cents, a USPS employee will come to my house, pick up my letter and send it to any of the 50 United States, where it will be deposited directly into the mailbox of the addressee. What a bargain! I would pay, but people who don't mail a lot complain about the changes all the time. People just don't like change, and there's going to have to be a lot of change to save the USPS. I just I wish I knew what would really help, and how to get people behind it. Similar problems here in the UK, and I'd be happy to pay more for stamps to maintian a good service. I wish Royal Mail would pick up from my door & supply me with postage materials free of charge like USPS does. This puts me in a bind about the use of vintage stamps. Use them? 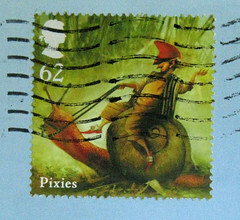 Use only stamps I bought from the post office recently? Or mix and match? Yeah, I know, Chris - I mix and match.